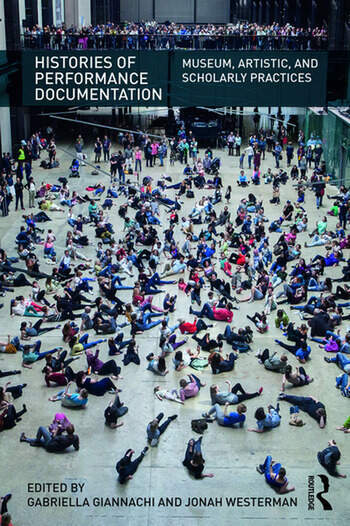 Histories of Performance Documentation traces the many ways in which museums have approached performance works from the 1960s onwards, considering the unique challenges of documenting live events. From hybrid and interactive arts, to games and virtual and mixed reality performance, this collection investigates the burgeoning role of the performative in museum displays. Gabriella Giannachi and Jonah Westerman bring together interviews and essays by leading curators, conservators, artists and scholars from institutions including MoMA, Tate, SFMOMA and the Whitney, to examine a range of interdisciplinary practices that have influenced the field of performance documentation. Chapters build on recent approaches to performance analysis, which argue that it should not focus purely on the live event, and that documentation should not be read solely as a process of retrospection. These ideas create a radical new framework for thinking about the relationship between performance and its documentation—and how this relationship might shape ideas of what constitutes performance in the first place. Chapter 1. Stuart Comer, Chief Curator in the Department of Media and Performance Art; Michelle Elligott, Chief of Archives, MoMA; Ana Janevski, Associate Curator; in conversation with Jonah Westerman, New York, April 2015. Chapter 2. Jay Sanders, Engell Speyer Family Curator and Curator of Performance, Whitney Museum of American Art, in conversation with Jonah Westerman, New York, April 2015. Chapter 3. Catherine Wood, Senior Curator International Art (Performance), and Pip Laurenson, Head of Collection Care Research, in conversation with Jonah Westerman, London, June, 2016. Chapter 4. Jill Sterrett, Director of Collections and Conservation, Rudolf Frieling, Curator for Media Arts, and Frank Smigiel, Associate Curator for Performance and Film, in conversation with Gabriella Giannachi, San Francisco Museum of Modern Art, San Francisco, August, 2015. Chapter 5. Christiane Berndes, Curator and Head of Collection, and Annie Fletcher, Chief Curator, Van Abbemuseum, in conversation with Jonah Westerman, Amsterdam February 2015. Chapter 6. Tim Griffin, Executive Director and Chief Curator, The Kitchen, in conversation with Jonah Westerman, New York, April 2015. Chapter 7. Philip Bither, William and Nadine McGuire Director and Senior Curator, Performing Arts; Eric Crosby, Associate Curator, Visual Arts; Robin Dowden, Director, New Media Initiatives; Fionn Meade, Artistic Director; Walker Art Center, in conversation with Jonah Westerman, Minneapolis, April 2015. Chapter 8. RoseLee Goldberg, Founding Director and Curator, Performa, in conversation with Jonah Westerman, New York, May 2015. Chapter 9. Gaby Wijers, Director, LIMA, in conversation with Jonah Westerman, Amsterdam, February, 2015. Chapter 10. Pics or It Didn’t Happen: Amalia Ulman Interviewed by Catherine Wood. Chapter 11. ¬Performing the Archive and Exhibiting the Ephemeral by Barbara Clausen. Chapter 12. At the edge of the ‘living present’: re-enactments and re-interpretations as strategies for the preservation of performance and new media art by Gabriella Giannachi. Chapter 13. Documenting Interaction by Katja Kwastek. Chapter 14. Screen Capture and Replay: Documenting Gameplay as Performance by Henry Lowood, Eric Kaltman and Joseph C. Osborn. Chapter 15. Mixed Reality Performance through Ethnography by Peter Tolmie and Steve Benford. Afterword: The intention of the artist and the point of view of the audience, performance documentation revisited, by Gabriella Giannachi. Gabriella Giannachi is Professor in Performance and New Media at the University of Exeter, UK. Jonah Westerman is Assistant Professor of Art History at Purchase College, State University of New York. From 2014-2016 he was AHRC Postdoctoral Research Associate at Tate, and in 2016-17 he was Chester Dale Senior Fellow in Art History at The Metropolitan Museum of Art.